Want to have an easy peasy appetizer ready to be whipped up at any time? Quick, go stock up on some cocktail weenies and bacon and keep ’em in the fridge and check your pantry and make sure you keep some brown sugar in there. Now if you’re Puddie, you’d giggle that I said “weenies” and I’d roll my eyes at you. 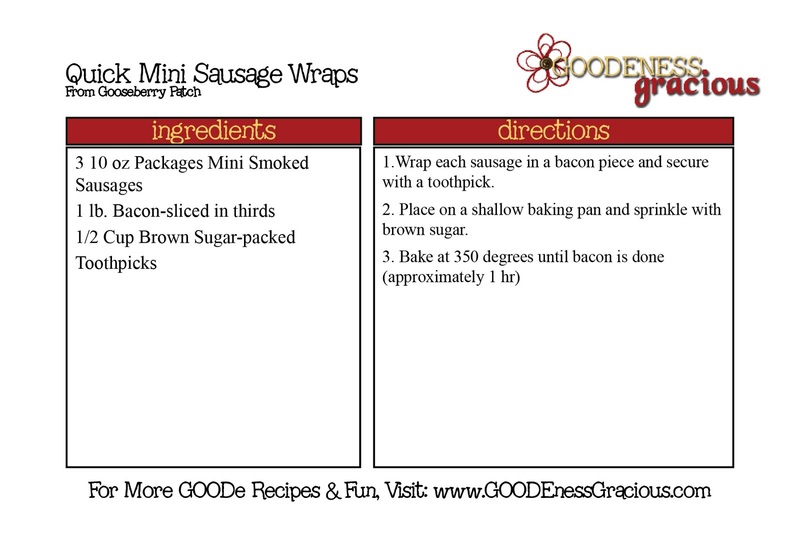 Anyhoo, he’ll thank me and my weenies when company calls this holiday season and they show up all hungry and stuff, I have all I need for some tasty little treats– Quick Mini Sausage Wraps– tonight’s Goode & Gooseberry Patch Project recipe. Now create your assembly line. Dump out some toothpicks, put your weenies in a bowl and line up your bacon. True story… I dumped out EXACTLY the right number of toothpicks to bundle up my wraps. Now pop your little bundles of joy on a shallow baking dish and sprinkle with 1/2 cup brown sugar. Now bake up at 350 degrees for around an hour until the bacon is done. Previous Post: « Always Requested Spinach Dip–No REALLY! Got the candle yesterday. It's luscious!! Thanks again.